Sprout worried that the farmer's wife will leave her egg behind. The egg is chalky and flecked with blood. She hasn't laid an egg in two days. She can't stand upright but managed to lay an egg without having eaten anything. Her cage is near the entrance and she can see the sceneries beyond the mesh walls. She feels amazed with the acacia tree which covers with white fragrant flowers and the white flowers fall like snowflakes when the season changes. Sprout is an egg-laying hen which comes to the coop over a year before. Since then, she only lay eggs and she can't wander around, flap her wings, or even sit on her own eggs. Since she sees a hen running around the yard with the adorable chicks, Sprout wishes that she can hatch an egg and watch the birth of her chick. Unfortunately, it's just a dream as the coop is tilted forward and the egg will roll the other side of a barrier. Sprout has no desire to lay another egg and upset everytime the farmer's wife took her eggs. She is exhausted after a year of this. Sprout feeling envious of the acacia tree and she names herself as Sprout, hoping that she can do the same thing as the acacia tree. As she looking at the outside world, she has a lot of desires and yearns for freedom. She wants to be like the yard hen, digging through the pile of compost with the rooster and walk side by side with him, and sit on her eggs. She doesn't understand why she is in the coop whereas the hen is out in the yard. Sprout isn't aware that the rooster and the hen were organically raised native Korean chickens. If she knows that an egg she lays will never hatch, she might never dream of hatching one. When the farmer comes to feed her, he is surprised that she never eats at all. When the farmer collects the egg, the egg starts to crack. Sprout is shocked with the thin shell of the egg. She feels heartbroken and starts to cry. The farmer tosses the soft egg into the yard and the old dog licks it up. Sprout says to herself that she will never lay another egg. Sprout likes to stare out into the barnyard and fantasizing about nesting an egg, wandering around with the rooster and following the ducks. Those are just probably a dream as she hasn't laid an egg for the past few days. On the fifth day without an egg, she got awaken by the farmer's wife. The farmer's wife saying about culling and Sprout needs to be taken out from the coop. Sprout doesn't understand the word "cull" but she is excited about leaving the coop. She sleeps well and waited with anticipation. The next day, the farmer and his wife take Sprout out of the coop and put her in the wheelbarrow. The farmer's wife wondering whether the meat will be useful but the farmer is doubtful about it. The conversation doesn't register with Sprout who fills with excitement that she will live in the yard. Then other weak hens and healthy old hens but no longer can lay eggs are landed on top of her. Sprout is weighed down by hens and soon there isn't a sound. She feels difficult to breathe and struggling to escape from the wheelbarrow due to the stacking hens on top of her. She fantasizes the acacia tree blooming with flowers and she still dreaming to hatch an egg. After quite some time, she regains her consciousness and she hears a voice. The voice encourages her to run away and soon she steps on a pile of dead hens and in a large open grave. She can't believe that she is still alive. The voice once again, asking her to run away as she is being targeted by a weasel. Thinking that it was the rooster's voice, she hops out to a shallow hole and realizes that it was the mallard duck from the yard, the loner who always following the family duck. Sprout doesn't want to return to the coop but at the same time, she has no idea where to go and the weasel is still looking at them. She hopes the mallard will help her. Perhaps feeling sorry for her and also she's a hen, the mallard leads her to the barn despite he doesn't belong from there. When they return to the barn, the old dog claims that he is an excellent guard and he can't let anyone easily passes him. The ducks making jokes out of them and the ducks against Straggler of bringing Sprout to the barn. Sprout thought that everything will work well if she left the coop. She tries to defend herself but got scared by the ferocious dog. Straggler defends Sprout and says that she is brave to escape from the weasel and suggests to let her sleep at the corner of the barn. The leader of the duck scolding Straggler because he is just an outsider and should be grateful of being allowed to live in the barn. Then, the rooster claims that he's the head of the barn that can make every decision. Since it's getting late and the weasel probably will come by, he allows Sprout to stay in the barn overnight. She needs to leave once he announces the dawn. Sprout settles herself on the outer edge of the barn. A hen in the roost complaining about Sprout's existence which might affect her to hatch chicks. Sprout feels envy of the hen's beauty and she hopes that she can hatch an egg one day. She never pays attention to her appearance but she knows she is unattractive now. However, she thinks positive when she remembers she had escaped the coop and with the yard animals now. The thought doesn't last long when she doesn't know where to go after tomorrow and she is starving at that time. She wakes up earlier than the rooster and still hopeful that they will let her stay. When the rooster gets up, he insists that she should leave and returns to the coop but she refuses to go back to the coop. Straggler looks apologetic but she understands and thankful for all his help. She is starving and nowhere to go. When she looks at the acacia tree, she still feeling hopeful to lay an egg and hatch a chick. When the farmer's wife feed the yard animals, she runs to the trough but got attacked by the ducks. Neither she has the courage to go to the rooster's couple trough nor approach the dog. The farmer's wife recognizes her and considering to eat her but the farmer tells his wife that Sprout is sick and will die eventually or probably caught by a weasel. Sprout feels relieved. Although life in the yard is tougher than she had imagined, she never has the desire to return to the coop. She remembers the compost pile dug by the rooster couple. She sees a juicy worm but quickly pecked by the rooster's hen and herded her off the yard. Sprout's body is aching but her hunger trumps her pain. She goes to the garden and pecks some bits of green cabbage. She keeps exploring and finds vast fields surrounding her. Sprout is full of joy and she knows this is out of the rooster's and the hen's guard. Sprout feels happy spending her time in the fields where no other animals will chase her away. However, as night comes, she starts to feel worried and there is nowhere in the field for her to hide from the weasel. Sprout returns to the yard but the dog has a strict rule of guarding the place. She has no place to go but has to scratch a shallow hole under the acacia tree. The hen starts to sitting on a nest in the bamboo thicket. Sprout feels upset that she hasn't laid an egg. She starts to question the point of her life if she can't lay an egg? When Straggler finds a best friend, she feels lonelier. One day, Straggler doesn't come back to the barn and also not in the reservoir. She feels upset that her best friend is leaving her without saying goodbye. For the first time, she finds herself missing the coop and looks longingly to the barn. When Sprout finds a white egg in the briar patch, she is so excited. Although she feels she can't lay eggs anymore but she is happy enough that she can sit on an egg. She wants to protect the egg until the mother returns. However, as time passes by, she loves the egg. She is not sure whether she will give up the egg if the mother comes back. On the next morning, she feels surprised when she sees Straggler. Straggler looks sad but she feels relieved that he doesn't know about the egg. The following day, Straggler follows the brace of duck to the reservoir. He returns with a fish and places it in front of the patch before he leaves again. Straggler brings Sprout a fish every day. Some nights, Straggler seems like dancing with loud quacks or even running like being chased. Despite they are best friends, she feels frustrated with Straggler of the disturbance at night. His right wing doesn't look the same anymore and he feels angry when Sprout mentions his mate, the white duck. He advises Sprout to leave to the reservoir once the egg hatches as the weasel will start to hunt again. Sprout has a full trust in him that she will be safe as long as he is around until one night, Straggler becomes the weasel's victim. Sprout feels helpless that she couldn't save her best friend. However, the sadness doesn't last long because when the next morning arrives, the egg finally hatches. Sprout is very proud now with her fuzzy light brown baby. When the old dog sees her with the baby, he reports it to the rooster. How can a chicken hatch a duck? When Sprout tries to remember the first scream which she heard and the sequence of events happened between her and Straggler, it starts to make sense. Straggler knows about the egg and he is sacrificing himself to protect the egg from the weasel as he knows the egg is going to hatch around that time. This angers the rooster and brings humiliation to his own kind. Since this is such a complicated issue, they organize a meeting but no decision is made due to the differences of opinions. The leader of the ducks wants to keep the baby but the hen disagrees with it. As they keep arguing, Sprout hears the farmer's wife is considering to put Sprout into the coop or probably cook her as soup and her baby's wings will be clipped as well. Worrying about their fate tomorrow, Sprout brings the duckling along and leaves the yard on the next morning before the rooster wakes up. When they are on the way to the reservoir, the leader of the duck asks her why she leaves the barn and definitely, she will be safer in the barn. The leader of the duck thanked her for hatching the egg as there are not many ducks left. Most of the eggs have been collected by the farmer. Sprout worried that the baby's wings will be clipped but the leader of the duck tells her that it's for the duckling's own good since he's a wild duck else he will end up like Straggler. Sprout tries to protect the duckling from the water but in the end, he can just swim on his own. Feeling unsafe with the current place, Sprout leaves with Baby and stays near the willow tree, scattered with cow patties. They are now wanderers without a home. The thought of Straggler motivates her to stay stronger to protect Baby. The next day, when they return to the reed fields, the reed warblers had been attacked and the nest had been torn apart with broken shells everywhere. Sprout vows not to make a permanent home anywhere. As days go by, Sprout is getting thinner and older while Baby is growing and looking more like Straggler. Sprout named him Greentop, after his coloring although she likes to call him Baby, as that made her feel closer to him. They have been wandering around all these time to avoid the weasel. One night, Sprout courageously fight with the weasel to protect Greentop. When Sprout regains consciousness after the fight, she sees the ability of Greentop to fly. Sprout feels lonely as Greentop spends more time flying whereas Greentop feels he can't cluck like his mom. Despite that, they worry about each other's safety. Greentop tells Sprout that he wants to return to the barn and join the brace as he wants to be accepted by his own kind. He knows Sprout loves him but still, they are different. However, Sprout insists not to return to the yard and tries to convince Greentop that he's smart and better than the animals there. Their lives are fine right now and they don't have to return to the yard. She still loves him despite their differences. At dawn, Greentop goes to the reservoir and from the slope, Sprout sees the ducks are treating him badly but Greentop still stick to them. As the sun sets, Greentop follows the ducks returning to the yard. Sprout calls him to come back as she feels he will be lonely in the yard because he is special and the yard animals won't accept him. At first, Sprout is waiting for Greentop to be kicked out from the yard so she can bring him back to the reservoir. The farmer not only wants to keep Greentop but even ties him on the wooden stilts in order to tame him. Sprout wants to save him but she doesn't know what to do. The next day, the weasel which has blinded an eye after a fight with Sprout is targeting the cockerel. Greentop starts to holler and the dog barks but the weasel is fast to grab the cockerel. The farmer blames the wife for tying Greentop which attracts the weasel. When the wife is untying Greentop, Sprout keeps pecking her and Greentop flies away. Although they are living separately after that incident, they still care about each other's safety. One day, countless stragglers flying to the reservoir. Now Sprout understands why Straggler wants Greentop to be in the reservoir. Straggler wants him to grow up and fly away, following his own kind. Sprout embraces Greentop for a long time and probably this might be the last time. Greentop is a respectable lookout now. Nobody ignores him anymore. When the mallard ducks circling the reservoir, Sprout noticed a weasel. Worrying about Greentop's safety, she fights against the weasel and even uses the weasel's baby as a hostage. Sprout tells her that she has an exhausted life of keep running from her but the weasel tells Sprout that she is the exhausted one, having blisters on her feet of following Sprout all these time. Sprout tells the weasel where to get her food as long as she promised that she won't hurt Greentop. It's a cold and windy spring day. The mallards are leaving for the up north. Greentop circling briefly around her to say goodbye. Sprout feels sad and terribly lonely when Greentop leaves her. She wishes she can fly. Snow begins to fall. The starving weasel appears in front of Sprout. She remembers the weasel's soft babies. She has no reason to run nor energy to do so. Sprout asks the weasel to eat her so that the weasel can feed her babies. From an Asian perspective, it was a beautiful story with simple characters and the author is trying to convey a message about motherhood which is easily understood by the readers, but I have to admit that I have issues with gullible characters. I can't stand with gullible or naive people that are stubborn when they don't understand your logical reasons. For other readers, Sprout probably is a very caring, loving and protective mother. As for me, I just couldn't stand a gullible and stubborn character which prioritises her own dream than the safety of others. I've been trying hard to convince myself to think from her point of view since she is just a hen confined in a coop and that's the reason that she always feel that the outside world is better. It took several attacks and humiliations before she can accept the cruel fact about the animals in the barnyard and stop dreaming of living there. However, my rating for this book will not be affected by my personal intolerance. 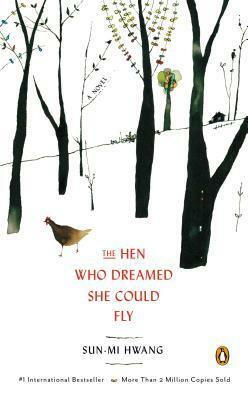 More reviews can be found on Goodreads: The Hen Who Dreamed She Could Fly.